Wonderful Incarnation – Behaviour of Sai Baba – His Yoga Practices – His All-pervasiveness – Leper Devotee’s service – Master Khaparde’s Plague-case – Going to Pandharpur. Sai Baba knew all Yogic Practices. He was well-versed in the six processes including Dhauti (Stomach-cleaning by a moistened piece of linen 3″ in breadth and 22 1/2″ in length), Khandayoga, i.e., separating His limbs and joining them again, and Samadhi, etc. If you think that He was a Hindu, He looked like a Yavan. If you think Him to be a Yavan, He looked like a pious Hindu. No one definitely knew whether He was a Hindu or a Mahomedan. He celebrated the Hindu festival of Rama-Navami with all due formalities, and at the same time permitted the ‘Sandal’ procession of the Mahomedans. He encouraged wrestling bouts in this festival, and gave good prizes to winners. When the Gokul Ashtami came, He got the ‘Gopal-Kala’ ceremony duly performed and on Id festivals, He allowed Mahomedans to say their prayers (Namaj) in His Masjid. Once in the Moharum festival, some Mahomedans proposed to contruct a Tajiya or Tabut in the Masjid, keep it there for some days and afterwards take it in procession through the village. Sai Baba allowed the keeping of the Tabut for four days, and on the fifth day removed it out of the Masjid without the least compunction. If we say that He was a Mahomedan, His ears were pierced (i.e. had holes according to Hindu fashion). If you think that He was a Hindu, He advocated the practice of circumcision (though according to Mr. Nanasaheb Chandorkar, who observed Him closely, He was not Himself circumcised. Vide article in Sai Leela on “Baba Hindu Ki Yavan” by B.V. Deo, page 562). If you call Him Hindu, He always lived in the Masjid; if Mahomedan, He had always the Dhuni – sacred fire there, and the following things which are contrary to Mahomedan religion, i.e., grinding on the handmill, blowing of the conch and bells, oblation in the fire, Bhajan, giving of food, and worship of Baba’s Feet by means of ARGHYA (water) were always allowed there. If you think that He was a Mahomedan, the best of Brahmins and Agnihotris, leaving aside their orthodox ways, fell prostrate at His Feet. Those who went to make enquiries about his nationality, were dumb-founded and were captured by his darshana. So none could definitely decide whether Sai Baba was a Hindu or a Mahomedan*. (see below this paragraph) This is no wonder; for he who completely surrenders himself to the Lord, by getting rid of his egoism; and body – consciousness thus becomes one with Him, and has nothing to do with any questions of caste or nationality. Such a one as Sai Baba was, saw no difference between caste and caste and even beings and beings. He took meat and fish with Fakirs, but did not grumble when dogs touched the dishes with their mouths. Such a unique and wonderful incarnation was Sai Baba. On account of the merits in my past birth, I had the good fortune to sit at His Feet and enjoy His blessed company. The joy and delight I derived therefrom was incomparable. In fact Sai Baba was pure Anand and Consciousness. I cannot sufficiently describle Him, His greatness and uniqueness. He who took delight at His Feet, was established in His own self. 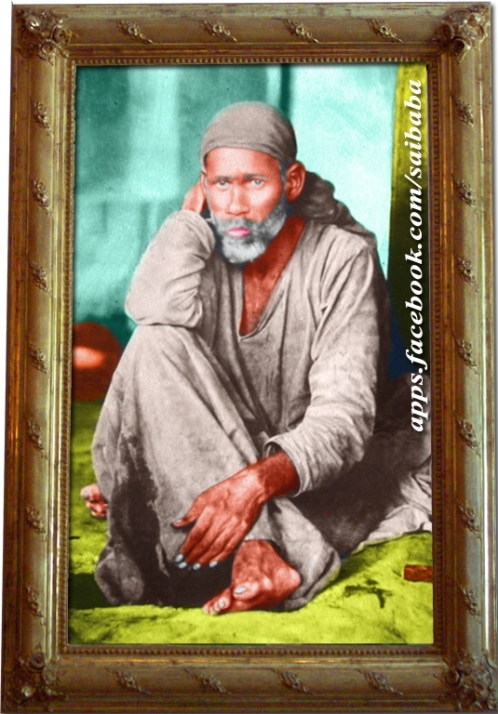 Many Sanyasis, Sadhakas and all sorts of men aspiring for salvation came to Sai Baba. He always walked, talked and laughed with them and always uttered with His tongue ‘Allah Malik’ (God is the sole owner). He never liked discussion or arguments. He was always calm and controlled, though irritable at times, always preached full Vedanta and nobody knew till the last Who was Baba. Princes and poor people were treated alike by Him. He knew the inmost secrets of all, and when He gave expression to them, all were surprised. He was the repository of all knowledge, still He feigned ignorance. He also disliked honour. Such were the characteristics of Sai Baba. Though, He had a human body, His deeds testified to HIS Godhood. All people considered Him as the Lord God in Shirdi. Fool that I am, I cannot describe Baba’s miracles. He got almost all the temples in Shirdi repaired. Through Tatya Patil, the temples of Shani, Ganapati, Shankar-Parvati, Village Deity, and Maruti were put in order. His charity was also remarkable. The money He used to collect as Dakshina was freely distributed, Rs.20 to some, Rs.15 or 50, to others everyday. The recipients thought that this was ‘pure’ charity money, and Baba wished that it should be usefully employed. People were immensely benefited by having a darshana of Baba. Some became hale and hearty; wicked people were turned into good ones. Kushtha (Leprosy) was cured in some cases, many got their desires fulfilled, without any drops or medicine being put in the eyes, some blind men got back their sight and some lame ones got their legs. Nobody could see the end of His extraordinary greatness. His fame spread far and wide, and pilgrims from all sides flocked to Shirdi. Baba sat always near the Dhuni and eased Himself there, and always sat in meditation; sometimes with and on other times without a bath. He used to tie a white turban on his head; and wear a clean Dhotar round his waist, and a shirt on his body. This was his dress in the beginning. He started practicing medicine in the village, examined patients and gave medicines. He was always successful, and He became famous as a Hakim (Doctor). A curious case may be narrated here. One devotee got his eye balls quite red and swollen. No Doctor was available in Shirdi. The other devotees took him to Baba. Other Doctors would use ointments, Anjans, cow’s milk and camphorated drugs etc., in such cases. Baba’s remedy was quite unique. He pounded some ‘BEEBA’ (Some Carpus Ana Cardium i.e. marking nuts) and made two balls of them, thrust them on in each eye of the patient and wrapped a cloth-bandage round them (eyes). Next day, the bandage was removed and water was poured over them in a stream. The inflammation subsided and the pupils became white and clear. Though the eyes are very delicate, the BEEBA caused no smarting; but removed the disease of the eyes. Many such cases were cured and this is only an instance in point. (1) DHAUTI or CLEANING PROCESS: Baba went to the well near a Banyan tree at a considerable distance from the Masjid every third day and washed his mouth and had a bath. On one occasion, He was seen to vomit out his intestines, clean them inside and outside and place them on a Jamb tree for drying. There are persons in Shirdi, who have actually seen this, and who have testified to this fact. Ordinary Dhauti is done by a moistened piece of linen, 3 inches broad 22 1/2ft. long. This piece is gulped down the throat and allowed to remain in the stomach for about half an hour for being reacted there and then taken out. But Baba’s Dhauti was quite unique and extraordinary. (2) KHANDA YOGA: In this practice, Baba extracted the various limbs from His body, and left them separately at different places in the Masjid. Once, a gentleman went to the Masjid, and saw the limbs of Baba lying separately at separate places. He was much terrified; and he first thought of running to the village officers, and informing them of Baba being hacked to pieces and murdered. He thought that he would be held responsible, as he was the first informant, and knew something of the affair. So he kept silent. But next day when he went to the masjid, he was very much surprised to see Baba, hale and hearty and sound, as before. He thought, that what he had seen the previous day, was only a dream. Baba practised Yoga since, His infancy and nobody knew or guessed the proficiency He attained. He charged no fees for His cures, became renowned and famous by virtue of His merits, gave health to many a poor and suffering person. This famous Doctor of doctors cared not for His interests, but always worked for the good and welfare of others, Himself suffering unbearable and terrible pain many a time in the process. One such instance, I give below, which will show the all-pervasive and most merciful character of Sai Baba. On hearing the news of Baba’s hand being burnt from (Shama) Madhavrao Deshpande, Mr. Nanasaheb Chandorkar, accompanied by the famous Doctor Parmanand of Bombay with his medical outfit consisting of ointments, lint and bandage etc. rushed to Shirdi, and requested Baba to allow Dr. Parmanand to examine the arm, and dress the wound caused by the burn. This was refused. Ever since the burn, the arm was dressed by the leper devotee, Bhagoji Shinde. His treatment consisted in massaging the burnt part with ghee and then placing a leaf over it and bandaging it tightly with Pattis (bandages). Mr. Nanasaheb Chandorkar solicited Baba many a time to unfasten the Pattis and get the wound examined and dressed and treated by Dr. Parmanand, with the object that it may be speedily healed. Dr. Parmanand himself made similar requests, but Baba postponed saying that Allah was His Doctor; and did not allow His arm to be examined. Dr. Paramanand’s medicines were not exposed to their air of Shirdi, as they remained intact, but he had the good fortune of getting a darshana of Baba. Bhagoji was allowed to treat the hand daily. After some days, the arm healed and all were happy. Still, we do not know whether any trace of pain was left or not. Every morning, Bhagoji went throught his programme of loosening the Pattis, massaging he arm with ghee and tightly bandaging it again. This went on till Sai Baba’s Samadhi (death). Sai Baba, a perfect Siddha, as He was, did not really want this treatment, but out of love to His devotee, He allowed the ‘Upasana’ – service of Bhagoji to go on un-interrupted all along. When Baba started for Lendi, Bhagoji held an umbrella over Him and accompanied Him. Every morning, when Baba sat near the post close to the Dhuni, Bhagoji was present and started his service. Bhagoji was a sinner in his past brith. He was suffering from leprosy, his fingers had shrunk, his body was full of pus and smelling badly. Though outwardly he seemed so unfortunate, he was really very lucky and happy, for he was the premier servant of Baba, and got the benefit of His company. I shall now relate another instance of Baba’s wonderful Leela. Mrs. Khaparde, the wife of Mr. Dadasaheb Khaparde of Amraoti, was staying at Shirdi with her young son for some days. One day the son got high fever, which further developed into Bubonic plague. The mother was frightened and felt most uneasy. She thought of leaving the place for Amraoti, and went near Baba in the evening, when He was coming near the Wada (now Samadhi Mandir) in His evening rounds, for asking His permission. She informed Him in a trembling tone, that her dear young son was down with plague. Baba spoke kindly and softly to her, saying that the sky is beset with clouds; but they will melt and pass off and everything will be smooth and clear. So saying, He lifted up His Kafni up to the waist and showed to all present, four fully developed bubos, as big as eggs, and added, “See, how I have to suffer for My devotees; their difficulties are Mine.” Seeing this unique and extraordinary deed (Leela), the people were convinced as to how the Saints suffer pains for their devotees. The mind of the saints is softer than wax, it is soft, in and out, as butter. They love their devotees without any idea of gain, and regard them as their true relatives. Baba sang and the devotees followed Him. In a short time Nanasaheb came there with his family, prostrated before Baba and requested Him to accompany them to Pandharpur and stay with them there. This solicitation was not necessary, as the devotees told Nanasaheb that Baba was already in the mood of going to Pandharpur and staying there. Hearing this Nanasaheb was moved and fell at Baba’s Feet. Then getting Baba’s permission, Udi (sacred ashes) and Blessings, Nanasaheb left for Pandharpur. There is no end to Baba’s stories, but let me now make a halt here, reserving for the next Chapter other topics, such as importance of human life, Baba’s living on alms, Bayajabai’s service and other stories. Thank you, thank you, thank you Sai Ram for blessing me with all the happiness, joy and prosperity. For making my dreams come true.On Sai Ram. Om Sai Ram Jai Sai Ram Please Baba shower your benevolent blessings on all your devotees. Everybody loves you. Thank you, thank you , thank u Sai Baba for blessing me with all the happinesjoy and prosperity. On Sai Ram. Sai ram i am very sad .Dad please help me . I simply want to say I am beginner to weblog and seriously loved your page. Almost certainly I’m want to bookmark your blog post . You really come with wonderful stories. Thanks a bunch for sharing your blog. I¡¦ve been exploring for a bit for any high-quality articles or weblog posts on this kind of space . Exploring in Yahoo I eventually stumbled upon this web site. Studying this info So i¡¦m happy to convey that I’ve a very just right uncanny feeling I found out just what I needed. I so much indubitably will make sure to don¡¦t put out of your mind this website and give it a glance on a constant basis. I gotten this specific diamond necklace as being a reward from the closest friend. It is just about the the majority of special gifts I have at any time received. This is behind the pendant is literally close to and dear to my personal heart when When i wear it! A formidable share, I simply given this onto a colleague who was doing somewhat evaluation on this. And he in fact purchased me breakfast because I discovered it for him.. smile. So let me reword that: Thnx for the treat! However yeah Thnkx for spending the time to discuss this, I really feel strongly about it and love reading extra on this topic. If doable, as you become experience, would you thoughts updating your weblog with more details? It is extremely useful for me. Big thumb up for this blog put up! however certainly you’re going to a well-known blogger should you aren’t already. Shri Sai Satcharitra (English) Chapter 7 - Wonderful Incarnation - Behaviour of Sai Baba - His Yoga Practices - His All-pervasiveness - Leper Devotee’s service - Master Khaparde’s Plague-case - Going to Pandharpur.